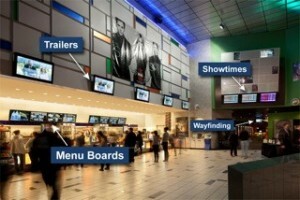 As Billy Budwitz, Director, Information Systems at Rave Cinemas pointed out in a comment earlier on this site it was Christie’s Managed Service team who provided the installation services for the Rave Cinemas Network. We also got our hands on this (exclusive) pic which nicely (and neatly) tags all the elements of the installation. We are looking forward to both the Digital Signage Guided Installation Tour at #dse2012 and our own sneak behind the scenes look separately as well. Looks like a great install and a nice network so big hats off to Ken Goldberg (though I am sure he had nothing to do with the clever bits) and his team! This entry was posted on Tuesday, February 14th, 2012 at 17:15 @760 and is filed under DailyDOOH Update. You can follow any responses to this entry through the RSS 2.0 feed. You can leave a response, or trackback from your own site. Neat installation. Nice variety of technologies and solutions. Any interactivity with mobile app and online CRM? Currently, the digital signs do not have an interface with mobile or CRM apps. If you think about the different use cases of the signs themselves, a few ideas come to mind. We are talking about enhancements like that going forward, but focused on completing the full rollout in the short term. Making it happen after that would be a combination of content strategy and technology.